When will DWD nerf this degenerate card? Oni Ronin has 3 points of stats for 1 mana and it's one of the most pushed aggro cards in Set 1, possibly ever. 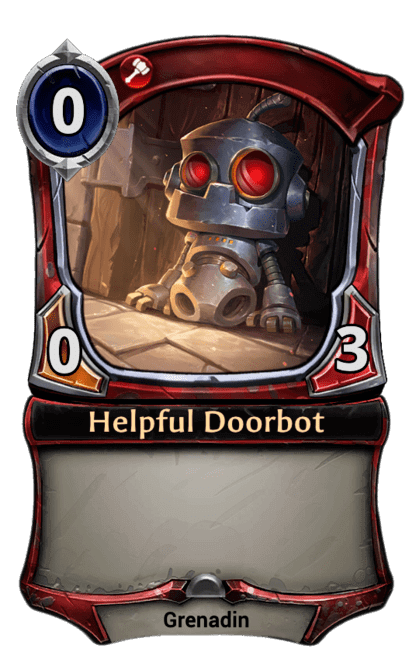 Helpful Doorbot has 3 points of stats for 0 mana, which is ridiculously undercosted. And if you're on the draw you often have NO answer to a Doorbot being dropped on Turn 1. This card is just way too easy to play and has way too little counterplay.